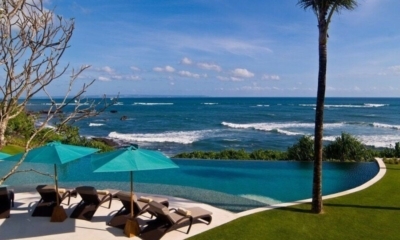 A breath-taking clifftop villa offering Balinese elegance, lush gardens and views for days. The 5 bedroom Villa Bayuh Sabbha located in the Bukit West and Uluwatu region should come with a warning – once you have spent some time here nowhere else will ever seem good enough again. Stretching serenely over 3 acres of lush tropical gardens full of ancient frangipani trees and bright bougainvillea, this luxurious villa hugs the cliff, serving up the type of views from which dreams are made. The ocean is your constant companion while on a truly clear day both Bali’s Mount Agung and neighbouring island Java’s Mount Bromo can be seen. 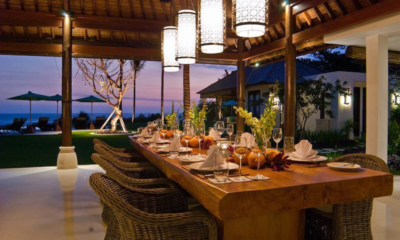 Supreme elegance meets traditional Balinese style with a mix of cool limestone, warm-toned teak and alang alang thatch, all intended to merge in perfect harmony with the profoundly beautiful ocean-side setting. Wide verandahs and floor to ceiling windows emphasise the space while highlighting the spectacular views and the whole is furnished with art, sculpture and tribal pieces to create a space perfect for rest and repose. Everything about this villa is exceptional with lap-of-luxury inclusions such as your own chef, a gym, tennis court, children’s play area, two private pools and spa facilities – and that is really just the tip of the ice-berg. The villa, which sleeps up to 10 people, also has a self-contained guest house with a distinctly beach house feel and its very own infinity pool for ocean gazing as you cool down from the day’s sun. You may decide you don’t want to move too far from this perfect cliff top retreat and why would you – everything you need is here. Your days can be spent sprawled underneath your open-sided wantilan pavilion complete with low sofas and a riot of soft cushions. Once the sun starts to sink you can grab yourself a drink and watch the colours of the tropical sunset from your sunset bale before soaking in your Jacuzzi or gathering with friends to share a meal and some holiday tales. Elegance, luxurious perfection and hours of ocean gazing await you at the Villa Bayuh Sabbha.